Written and analyzed by GM Mackenzie Molner. Photos taken by Austin Fuller. 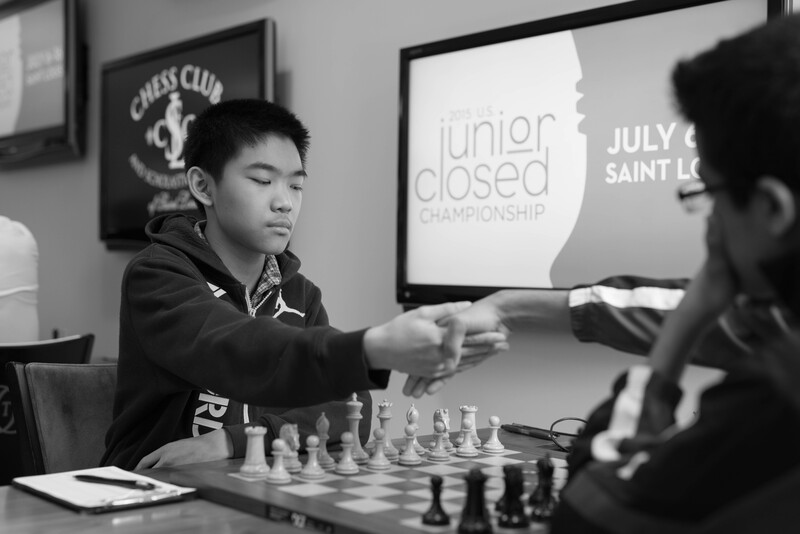 Easily the most anticipated game of the tournament: Jeffrey Xiong vs. Akshat Chandra. In addition to being the two highest rated players of the tournament, the winner of this game was guaranteed at least a share of first place. Jeffery Xiong, with the White pieces, couldn’t ask for a better situation in order to try to make a comeback over Chandra, who had half a point extra in the standings. Recently, the opening had been a source of headache for Akshat Chandra. In the two rounds prior to this, he was on the worse side of two draws, not to mention being massively behind on the clock in both games. He broke that trend in round seven by playing the Taimanov Sicilian more confidently than in his game against Ruifeng Li. Chandra was the first one to deviate from previous played games with his move 12… Rc8, even though it was a logical novelty. Chandra declined a pawn sacrifice on move 16, intending to safen his king by castling. It turns out that , accepting the pawn sacrifice with 16… Qxc2 would probably have lessened the pressure. Iin order for White to regain the pawn, Xiong would have to allow Black’s pieces to free themselves. Xiong built up strong pressure but took his foot off the gas with 23. cxb4. It was better to play 23. Rh3 with attacking chances. The more critical phase of the game was beginning to take shape once the players traded queens and headed into the endgame. The endgame was approximately equal but a lengthy king maneuver taking Xiong’s king from g1 down to h6 reaped great benefits. Xiong won Chandra’s h7 pawn and was in firm control of the game. With an extra pawn and strong bishop, it looked like he might be able to knock Chandra out of the lead for the first time in the tournament. It only took one inaccuracy for Chandra to balance out the game. Xiong’s 51st move, Bf6 allowed Black’s strong reply 51… b4! and equalizing the game. The two played out another 30 moves before agreeing to the draw in a theoretically already drawn endgame. Another narrow escape for Chandra! With that draw, Chandra now has 5/7 and Xiong has 4.5/7 going into round eight. These two players have been struggling a bit this tournament. Han was winless going into the game, and Liou’s 1 out of 4 in the past 4 rounds had left him struggling a bit. Han got a great position against Liou’s Schlecter Slav, which is not easy to do! Unfortunately for Han, he lost the feel for the position in the middlegame. 27. Rca6 would have kept a large advantage. After 27. Rc1 the position leveled out and a draw was agreed upon on move 32. Going into the game, I thought this was an interesting matchup. In this tournament, Brattain has been a very positionally oriented player and often playing very solid openings. Harmon-Vellotti on the other hand is often involved in wild tactical skirmishes in which the result can often swing back and forth between the players. Brattain’s choice of playing the Botvinnik English took nearly all tactical possibilities from the position. White was more comfortable, and with 26. Ne4, Brattain could have kept his slight advantage. Instead, Brattain chose Bg5, soon leading to several exchanges. The game stayed balanced until a draw was agreed on move 48. Last but not least was the game between these two talented players. After getting very lucky against Yian Liou in round 5, Ruifeng Li has been on the wrong side of swindles in the last two rounds. Li chose the combative Sicilian defense against Liang’s 1. e4. Liang sacrificed a pawn in the middlegame, reaching a very wild position. Li played fearlessly with his 17th move g5. Awonder needed to play 19. Bd6 in order to take advantage Li’s reckless play. Li’s combative play was rewarded, and he was soon able to reach yet another winning position. Unfortunately for him, he was not able to break the streak of draws and after playing 86 moves, the result was sealed. Coming into the round today, no one in the tournament was hotter than Arthur Shen. He was on a three game winning streak and climbed from a minus score all the way to shared second place. Michael Bodek with 3 out of 6 was not as hot as Shen, but still having a reasonable tournament. The game started out in surprising fashion. Despite nearly exclusively playing 1. e4, Bodek experimented with the English in round seven, possibly trying to catch Shen in a prepared Anti-Grunfeld variation. Shen solidly responded by playing the symmetrical English. Shen’s 5… Nh6 allowed Bodek to play aggressively with the tempting 6. h4 and starting a quick kingside attack. The attack disoriented Black’s position enough for White to win a pawn while still having a better position on top of that. It looked like Shen’s winning streak was coming to an abrupt end, but a badly timed bishop exchange evened out the chances. In a back and forth fight, Shen eventually emerged victorious, using the attacking features of an opposite colored bishop middlegame to bring the point home. Shen’s hot streak lives on! He now shares first place with Akshat Chandra. What a turnaround!